On visiting Tandy’s blog, Lavender and Lime her challenge for this week was to bake something sweet using almonds. 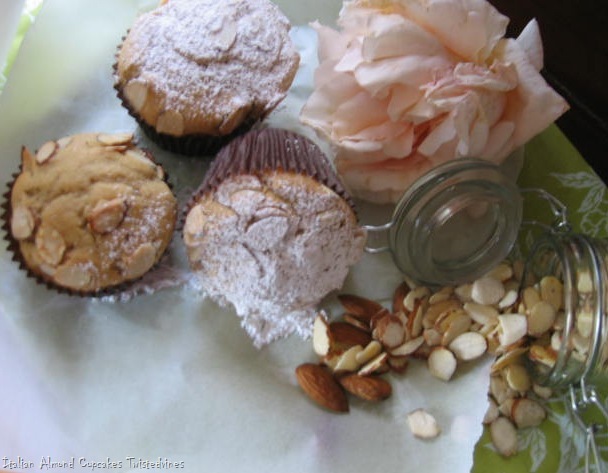 Looking through some new acquired cookbook magazines, my Mum asked if I had tried a recipe – Italian Almond Cupcakes….on the same day visiting Tandy’s blog. Coincidence – I decided to try the recipe and link back to join Tandy and her baking challenge. 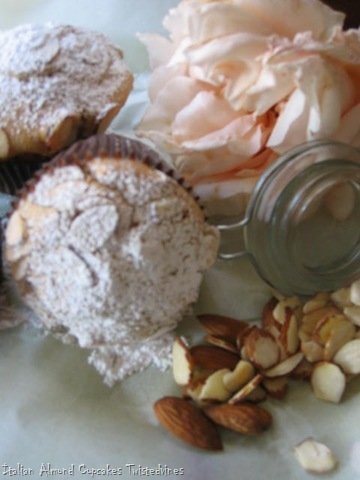 On further research of the recipe…the advertisement in the magazine was saying Italian Almond Cupcakes and the main ingredient – Dilmah’s Exceptional Tea. Refreshing and tasty this is a wonderful tea, and one to try, if you can find it on your supermarket shelves. If you would like to know more about Dilmah teas go to their home site here. Infuse 3 teabags in boiling water and leave for 3 minutes. Add the eggs one at a time, –beat after the addition of each one. Continue beating for 3 minutes until creamy. Have a great day everyone and Enjoy! What an incredible recipe Yvette – fabulous and as always so prettily photographed. 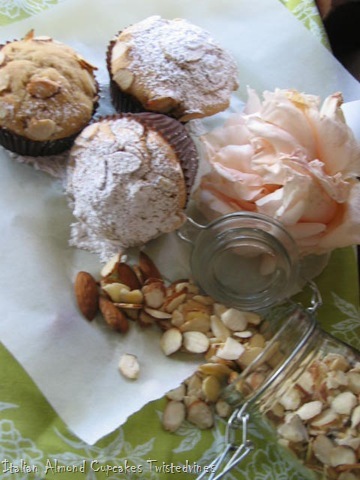 How lovely – have never seen almond tea here in Spain (which is strange as we have so many almonds!). What a great recipe and so beautifully photographed. Yvette, this sounds delicious! What a wonderful idea to flavor with tea. I wonder if it would work with a lovely rose tea? I must try these cupcakes. Thank you for sharing the recipe. 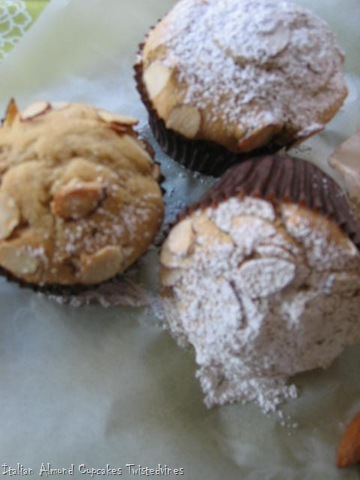 I’m glad your mom got her almond cupcakes and you got to bake something again. I love to hear you’re doing what you love. By the way, the photos are delicious looking, too. This sounds wonderfully delicious…especially the inclusions of the infused almond tea. Love the pics! I’d love to try but I have a frightful sweet tooth and I can eat myself sick! I’ve sen that tea before and wouldn’t have thought of adding it to cupcakes. Lovely!…love anything almondy. These cupcakes looks divine! 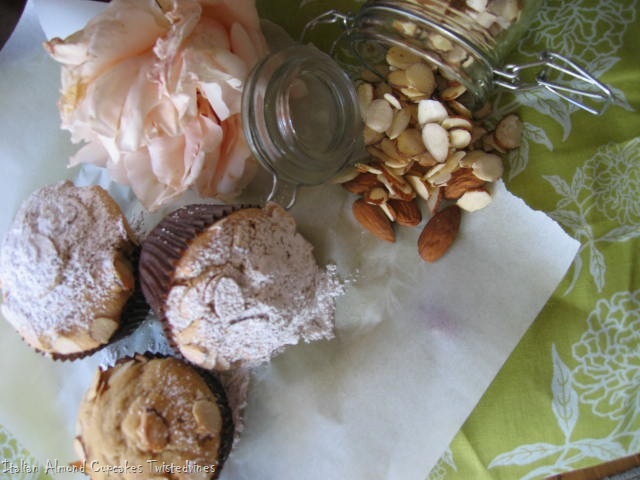 I adore almond anything and the powdered sugar softly sprinkled on top with the crunchy almonds is calling to me. The tea too sounds wonderful!